Here's my dream game: Super Tickle Fighter! It would be for touch screen devices and PC, with cursor support. 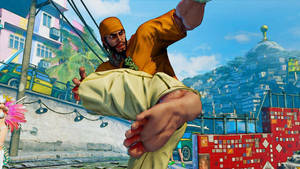 One of the game modes would be to challenge others to inflict as much tickle torment upon the victim as possible~ here we can see Ryu was chosen as the hapless victim! I imagine there would be a take-down and capture game before where you would acquire victims... Once you have your prison full of defeated fighters, you can 'Free Torture' or 'VS Torture'. Free Torture would be a mode where you leisurely tickle torture your prisoner of choice and VS Torture would pit you against another player with the same victim. As you tickle the victim's feet, the 'Hysterical' gauge will fill - the better your technique the faster it will fill. Once filled, the super tool you selected at the beginning of the match will become usable for a short period. For the drawing, the super tool is a chicken foot scratcher! The super tools range from the aforementioned chicken foot scratcher to an automated goat's tongue that works in tandem with your manual tickling! Changing your pattern of tickling, swapping out tools, carefully using the secondary tools, and strategically using your super move would help you get more points and make your victim suffer more than your challenger's. I love this idea! Easily one of your best works for sheer creativeness and something I wish existed. I do have 2 questions for you, how do you imagine the catch feature would work and who else do you think would be joining Ryu in this cast of sensitive men? Maybe something involving stripping them to get them ready for their futures as tickle toys, lol. Great idea! I feel you, a lot of characters out there who should be in this! If there is I want a portal to it. Sadly it's waaaay outside my capability, but who's to say some people that can could band together to realize it? We can sure as hell hope for that! Is it bad that I can actually imagine this app existiong? Here is a game that would be beautiful in 3D! I would very much like your idea to materialize. I think that with the different modes that already exist in the games there must be way to develop this! This is really entertaining. I think it would be even more interesting if each "victim" had a display to show the sensitivity of their bodies, as well as their own unique set of verbal expressions and physical gestures. I'd sure love to see who else you can choose to tickle in this game! Any chance you may do a follow-up to this? 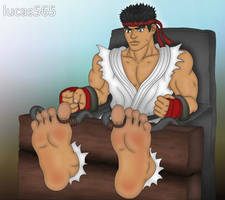 Ryu's feet are beautiul!!! nice work bro, hey please check out my galery, what do you think? Yeah, we all really need it!